You are on the verge of becoming part of elite group of smart actors. They're smart because they know the have some challenges with either creating or revealing emotion, thought or feeling and have taken the first step to identifying those challenges. Over a 1000 actors have already taken the Emotion Screen Test. Many, after identifying what was in their way of emotionally expressing went from struggling stage actors to very busy working on-camera actors! What is the Emotion Screen Test™? It's a trademark process that evaluates an actor's emotional expression by comparing the level of inner intensity with the out expression. 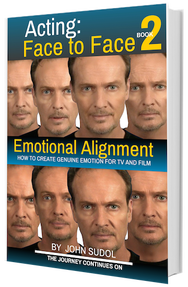 If your goal is to have a successful on-camera acting career you not only have to be emotionally free... but emotional precise. The Emotion Screen Test™ will show you exactly were you are with your emotion creating and emotion revealing skills and tools. Let’s work the book together. The goal of all on-line meetings is to give clarity, insights, tips and tools to all who have purchased Acting Face to Face 2. Whether you are just starting the book or you have finished it, if you have a question about emotion creating or emotion building, I want to be there to answer it. Focus and Commitment is Key​ To You Success! In today's world with the demands place on all of us, it's difficult to stay on track with your goals. My mission is to help you stay focus, achieve your goals and do it at an affordable price. That's why I created Acting Face to Face 2 "On-Line Meetings". This free introductory On-Line meeting is designed to help you get the most out of Acting Face to Face 2. Why Should you Participate in the On-Line Meetings? If you are unable to work with me in a live class the on-line meetings are the second best thing. Whenever you are learning something new, there are two things we all need; guidance and validation. These meetings are set up to do both. If you have a question, I'm there live with you to answer it immediately. If you are unsure about executing something you can show me. Can't I just work the book on my own? All you need to do for the free introductory meeting is to register. Once you register you will get an email from me outlining the steps to participate. Is a "meeting" another way of saying "Class"? No. It's a meeting to check in, have questions answered and get validation for what you're working on. Every meeting is different. Often in these meetings there are examples, demonstrations and exercises. Can anyone join these meetings? That would be a NO. You have to be invited by me to attend the on-line meetings . To be invited, you have had to purchased Acting Face to Face 2 (paperback or ebook), download the worksheets and be willing and committed to do the work. If you're not serious about your on-camera success, these meaning aren't a good match for you. Is there a charge for this first meeting? Absolutely not. This first meeting is 100% FREE! Will there be other meetings offered after I complete these? Good Question and YES. In the near future You will be able to continue your emotion training with me. There will be advanced classes and free meetings on everything from headshots to interpreting material. I will be offering these classes and meetings on the new membership site that is now be created. More about all this in the near future.